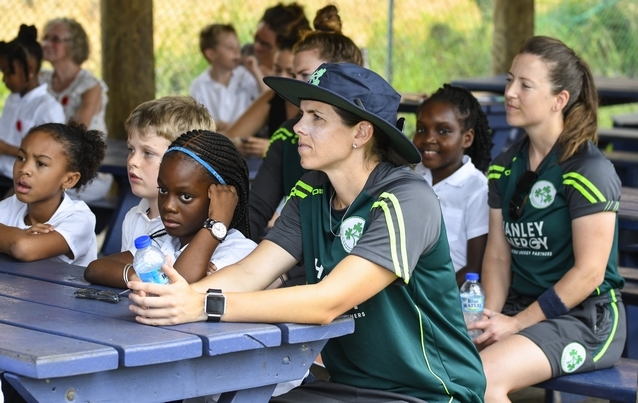 The Ireland Women’s team have paid a visit to the Christ the King High School in Antigua as part of the ICC ‘Cricket for Good’ initiative that aims to inspire the younger generation and encourage them to take to the sport. The ICC, in conjunction with Cricket West Indies, is delivering a school/community engagement programme to educate kids about the event and give them the unique opportunity to meet past and current international cricketers. The Irish squad spent a couple of hours meeting with the students and learning more about local culture, while providing the kids a sense of excitement at meeting the on-field stars. The squad play their second warm-up match against Sri Lanka tonight, then head back to Guyana to start the Group Stage matches on Sunday.